Discussion in 'Guides' started by AbsentNight, Jan 3, 2015. She's finally released. Yay I guess. Also thank you to those that come here to read this guide. Something you'll have to consider though is that Leader Skills will be rendered useless for most of the Trial. So your dual Tridon isn't going to help here. However, you should still have the best leads in your team like if you have Grah, you should be using him as a lead. Leader Skills will come back but only momentarily. With the plethora of units out there you could use, I am definitely not listing them all. Damage Mitigator - An obvious one here. 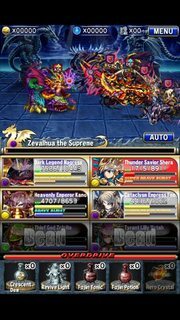 Zevalhua doesn't do attacks that are too strong outside of Glorious, Extension and Endless near the end. This is still very needed. Either friends or your own is fine. It'll also be good to get this every turn if you can. Healer - Zevalhua doesn't do too much damage outside of Extension, Glorious and Endless but these things are still needed for some good success. Some have done it without a healer but with very specific setups. Attacker - This is also a pretty obvious one. If you're going to do this without Magress, then you'll really need to do a lot of damage for Glorious or else. BB Support - A damage mitigator's best friend. Overall, this makes the fight a lot easier. Magress - The most popular choice for this trial when it initially came out in JPBF. Mainly for the attacks that hit like a bullet train i.e. Glorious. The DEF buff can help in taking damage too. If you think you can deal enough damage for Glorious, then Magress is not necessary. With many of the 7 s out there, it shouldn't be too hard to do that. This is especially important for this fight. Your LS's will be invalidated so spheres are going to be your only way of increasing survivability. Other then that, it's pretty straight forward. Below are examples of what you can use. Similar spheres may be used. Whatever you did for Maxwell to help count, whether using paper or just counting in your head, you should do here too. If you lose count when the final form comes, then guard everyone and keep HP full. Wait til you see her do Extension again. The next turn will be turn 1 then. Counting for the other attacks is not needed. Counting Lupine Alone can help with timing Endless so that your LS's will be up when it happens. Feel free to ask any questions, add anything I've missed or should add. xSoraix, Jaeyoung, aznljgame2001 and 6 others like this. This is pretty much the same as the threads in AI for teams that beat Maxwell and Cardes. Post your team you used to beat her here. This should help with team building for those who have yet to beat Zevalhua. Edit: This part of the guide may be a bit redundant now. Thanks for this @AbsentNight. I'll add it to the guides section at the top! A bunch of people have said that it was easier. I've seen some people struggling to beat her still though. I'd say that it's dependent on what you have available. any recommendation for current global available units? Sounds work but I feel dmg is not that good, I have breaker arus but no slot for him if I want Rashil become a target dummy. Using Rashil for Extinction also isn't really going to be very effective. I would rather bring a burst healer of some sort for this Trial over Rashil. Dealing damage is pretty important here. Selena is notably effective. Cardes friend also isn't going to help since LS will be invalidated most of the time. I'll definitely be paying close attention to this thread (like I did your Maxwell one) the closer we get to this being in Global and effectively asking a few questions again. Fortunately, we have a ton of time. I was able to beat her using this guide after struggling for a couple of days. 2 of my units died and I used all my items because I made a couple of mistakes towards the end of her 3rd form. Miscounted a few times ): coz I was counting on my head. What is this-ummm 'girl' taking? She hits like a freight train and keep on mumbling and casting something 'glorious'.. All that rage, man... Even PMS day 1 didnt come close like Zev's. So got her past endless and just kept hitting the wall known as Static Returner. I've seen many people run through this without a curse unit. Just curious as to what i did wrong. It may be a problem with your damage. If your damage is too low or inconsistent, then you won't be able to beat her. Think i might just man up and level my Kanon. Tried it with this squad first. I've seen this trial done with less and i was baffled that i kept failing to kill her.